This Apple Pie Monkey Bread is a deliciously sweet and easy dish that makes the perfect breakfast or dessert! With just a few ingredients and minimal prep time, this pull-apart bread is soft, gooey, and bursting with apple chunks and warm spices. One bit and this will become your favorite fall treat! Have you ever had it? Or even heard of it? To me, it’s one of the most deliciously sweet, addictingly (yep, that’s a word) easy dishes that I’ve ever had. I mean, pre-made biscuits, tossed in a cinnamon sugar mixture, coated with brown sugar and butter, and then baked until bubbly and golden. You really can’t get much easier than that, right? But, even though I love monkey bread, I’ve only made it a few times, mainly because I lose ALL self-control around this dish. I can barely contain myself as it’s hot from the oven and oozing with that caramel brown sugar goodness. Mmm mmm good! So, when I had the idea to take the classic monkey bread dish and give it a unique fall twist, this Apple Pie Monkey Bread lasted all of five minutes in my house. It was just that good! Oh, and side note, the hubster had never heard of (or tasted) monkey bread before I made this apple pie version. But, no worries, he’s now an official monkey bread convert….whew! If you like monkey bread, then I guarantee that you’ll go crazy over this Apple Pie Monkey bread. Warm, gooey, and topped with a sweet vanilla glaze. What more could you ask for? The ingredients are mostly the same as traditional monkey bread, but I rolled the dough in a mixture of brown sugar, white sugar, and cinnamon to give it a hint of a deeper flavor. And then comes the apple pie flavors. 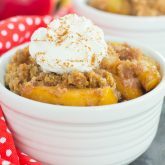 I used canned apple pie filling, because I love the slightly sweetened flavor and ease of just popping open a can. But, feel free to cut up some fresh apples if you prefer! And then there’s the glaze. I couldn’t help but top the monkey bread with a decadent vanilla glaze. It’s like the icing on the cake, err, bread! Once you smell this monkey bread baking, you’ll be anxiously awaiting it to be done. It’s best warm from oven, and oozing with a warm, caramel-y flavor. It’s also fun to eat! You can simply pull the chunks apart and devour, or slice it and eat with a fork! 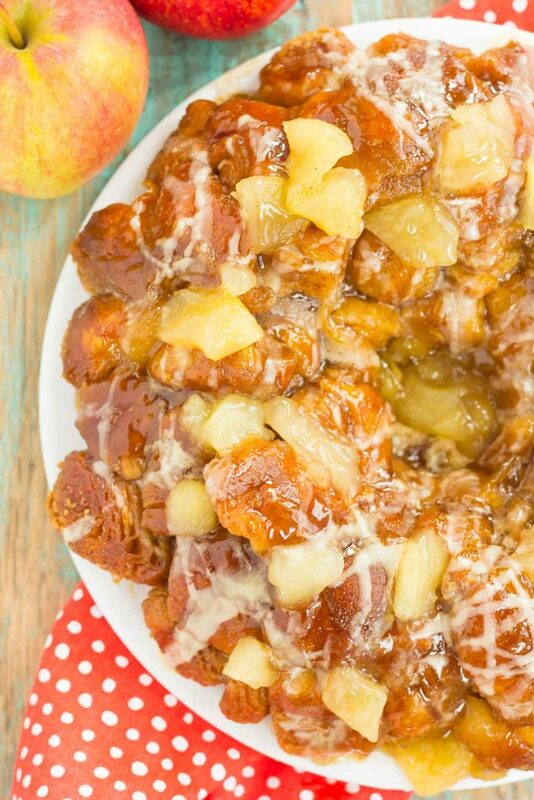 So, if you’re looking for a new, decadent breakfast or dessert for the fall, then this Apple Pie Monkey Bread is it! Looking for more apple pie recipes? I’ve got you covered! Preheat oven to 350F. Grease a 12-cup bundt pan with non-stick cooking spray. Set aside. In a small bowl, combine the brown sugar, white sugar, and cinnamon. Set aside. Separate each biscuit and cut into quarters. Roll each biscuit piece into the cinnamon sugar mixture. Place about half of the biscuit pieces in the prepared bundt pan. Spoon about half of apple pie filling over biscuits. Top with remaining biscuit pieces, followed by rest of apple pie filling. Set aside. To make the caramel sauce, add brown sugar and melted butter to a small bowl. Stir thoroughly to combine. Bake for 30-32 minutes, or until biscuits are golden and slightly set in the center. If biscuits brown too quickly, loosely cover the top of pan with foil. To make the vanilla glaze, add powdered sugar, heavy cream, and vanilla extract to a small bowl. Stir to combine. 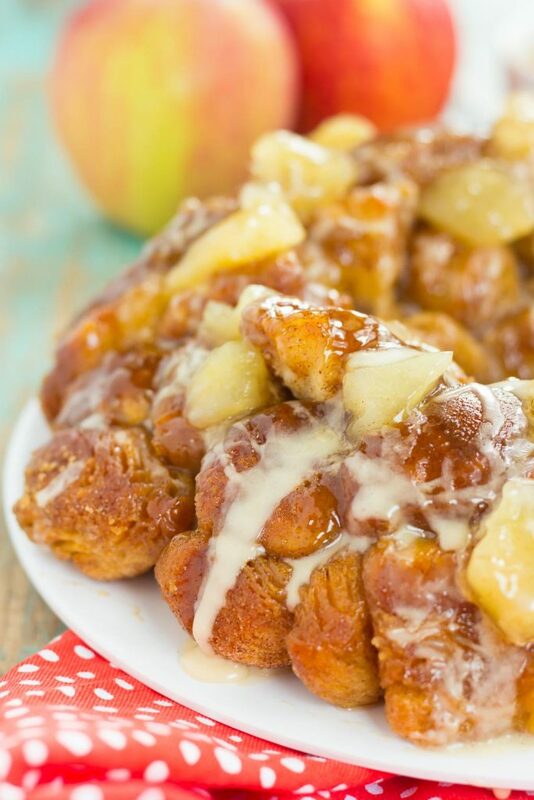 Monkey bread is so amazing, and I love your fall-inspired apple twist! You're right, though -- the stuff is totally addicting! Mmmm... Have a great week ahead, Gayle! Monkey bread is so good, Megan! Thanks! You've turned on my English teacher nerd side with "addictingly." Because ya know, it's becoming a word, but I'm all about keeping "addictively." Because that was the original, yo. Still, we shouldn't always stick with the original. Like this monkey bread! SO much better than the plain kind. It's gooey and gorgeous! Haha I agree...addictively is definitely right! :) Thanks for the kind words, Mir! I love monkey bread! I've only made it a couple of times myself but have loved it so much! your apple pie monkey bread looks amazing!!!! Looks SO GOOD! Thanks for the monkey bread love, Alice! My goodness you know just how to make a girl swoon! I can't believe your husband never had monkey bread before! So many wasted years! Haha right?! Good think I came along! :) Thanks, Shelby! If this monkey bread isn't PERFECT post long-weekend material I don't even know what is!! I seriously just want to dive into my screen with both hands right now because this bread seriously looks that good. All that caramel-y goodness is making me swoon! Thank you, Sarah! The caramel sauce gets me every time! 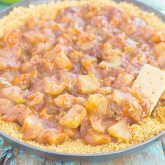 I seriously wish I had seen this Saturday, Gayle 'cause I had some biscuits in the fridge and this would have been fantastic to make!! I've heard of monkey bread, but have never made or had. Now, I'm wondering what I have been waiting for!! I think I would find this addictive too :). Pinning and making soon! Have a wonderful week, my friend! Monkey bread is so good, Dawn! And very addicting too, so I think you would love it! Thanks for the kind words and pin, Dawn! I lose self-control around monkey bread, too, and this one would be even worse because I LOVEEEE apple pie. I might have to make this in secret and eat the entire thing myself hehehe. Monkey bread is actually a tradition at my house for Christmas morning, so whenever I see it I get nostalgic.. and look around for presents. Lol! ;) Needless to say I'm a huge fan, so I'm loving this apple pie version!!! This looks way beyond delicious, Gayle! Pinned! Cheers, friend! Haha sorry I have no presents for you! It is such a great Christmas tradition, Cheyanne! And thanks for the kind words and pin! I'm with you -- I love monkey bread but hardly ever make it! For me, it's something I can only make when I have at least half a dozen friends around, because it's so good right out of the oven that I can't stop! Lol. LOVE this apple pie version! YES!! I need to remember to ONLY make this when I have others around who will eat it with me. Thanks, Ashley! Okay but seriously -- this is what I'd be served in heaven. Good grief -- that glaze and those apples!! Totally swooning. haha um yeah I have no self control around monkey bread either! So addictive!! I love this apple pie flavor! So perfect for fall!! 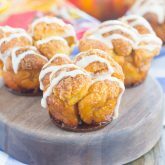 Apple pie flavors pair perfectly with that classic cinnamony flavor of monkey bread- I'm obsessed! Thank you, Medha! 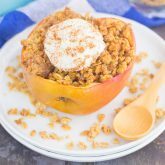 It's such a fun fall twist on the classic treat! I've never had (or made) monkey bread and never knew what it was till I started blogging! I know it would be my undoing because I love carbs, and this particular version with apple pie flavors sounds even better! This is such a guilty pleasure but it would be worth every bite! ???? It's definitely a guilty pleasure of mine! Thanks for the kind words, Marcie! Mmm this sounds so amazing! all that caramel is making me drool! WOW!! 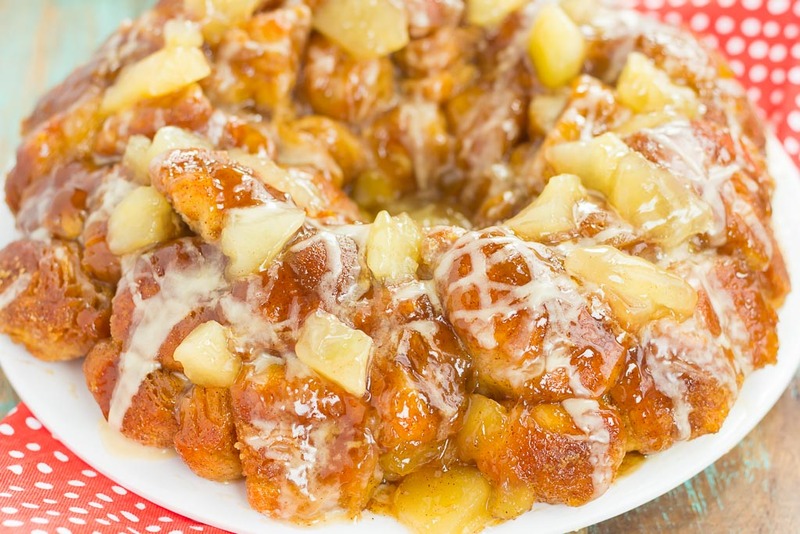 This apple pie monkey bread looks phenomenal Gayle! Definitely making my heart swoon!! Thanks for the monkey bread love, Jessica! We just made monkey bread for the first time a few weeks ago and my kiddos had a blast! I love this apple pie version, Gayle! It looks totally irresistible and perfect for fall! Isn't it the best? So addicting! Thanks for the kind words, Kelly! This looks so sticky and good! I for real want this right now!! I'm obsessed with apple pie and this monkey bread is EVERYTHING! Love it, Gayle!! I'll definitely go crazy over this Monkey Bread! I've had it before but not in the longest time!! Warm, gooey, and topped with a sweet vanilla glaze? You're right... What more could we ask for? It's definitely one of those hard-to-forget desserts! Thanks, Annie! Oh my goodness! This looks like one of the best tasting monkey breads I have ever seen. So gooey! Love that you used apples! Thanks, Christin! The apples make this extra special! Oh my gosh yessssss, this looks amazing!! Monkey bread? Check. Apple pie? Check. Both of those things are delicious, so I KNOW this has to be! Ooooh this looks dangerous! As in I'd probably polish it all off before Ben even got home ;) It looks absolutely amazing Gayle! you right, Gayle. This has become my favorite treat. :) it's apple season so we shouldn't miss it. everything made from apple is always great. such a nice recipe, thanks. Thank you, Pat! Apples were made to be in monkey bread! Gayle, I really enjoy reading all your posts. In this post, I feel happy when reading, really. I especially like below paragraph "Once you smell this monkey bread baking, you’ll be anxiously awaiting it to be done. It’s best warm from oven, and oozing with a warm, caramel-y flavor. It’s also fun to eat! You can simply pull the chunks apart and devour, or slice it and eat with a fork!" How lovely you describe your feeling. Thanks for sharing and have a nice weekend. Thank you, Sabrina! I'm so glad you enjoyed this! Hope you have a wonderful weekend! Money bread is one of my favorite sweet treats! 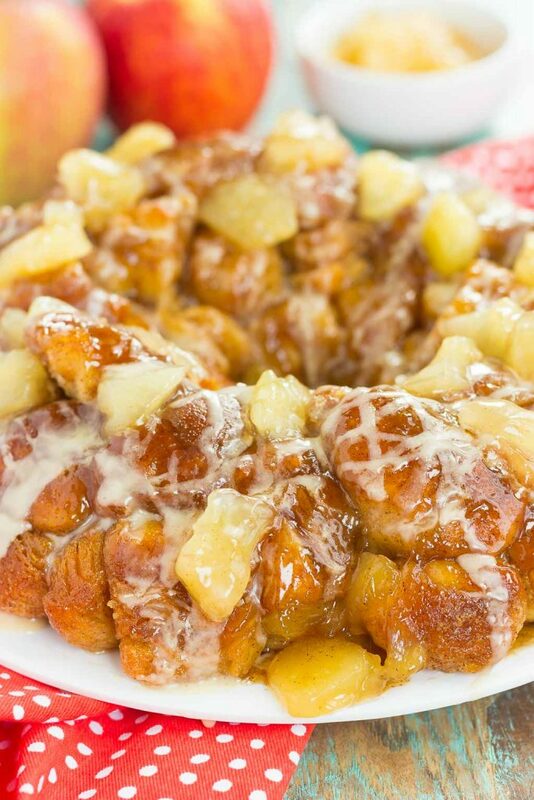 This twist on traditional monkey bread is perfect for the holidays, great idea! Thanks for the kind words and for stopping by, Eden! It's so good, Amy! I hope you and your husband enjoy this if you try it. Thanks for stopping by! I LOVE Monkey bread, but never made any. Yours looks Devine!! Sooo...what if I want to omit the apples, do I just DO it, and keep the rest of the recipe as is!? With glaze etc....? Hi Gigi! Yes, you can certainly omit the apples if you like, the glaze and other ingredients should remain the same. Hope you enjoy and thanks for stopping by! I'm sorry to hear that, Joseph! Thank you for letting me know. You may need to increase the cooking time then, as all oven vary.